This issue's cover artwork for Philip Pullman's Northern Lights is by Stuart Williams. Pullman talks to BfK's interviewer Geoff Fox. Thanks to Scholastic Childen's Books for their help in producing this January cover. Araminta Twigg is insufferable. She is the sort of child who gets ten out of ten in every single spelling test. The teachers love Araminta but the children do not. It is hardly surprising, then, that she is walking to school on her own the day the regular crossing lady is replaced by an economy version. The Headmaster says that Miss Thunderbuss is re-training and willing to work for half the normal rate. We, and Araminta, know that she is a witch. When the witch puts a spell on Araminta, no-one will believe her. Ironically, the bewitched Araminta's behaviour is seen as naughty by the adults but exciting, funny and normal by her peers. At the end of the book no harm has been done, the children have had their best day at school and Araminta has made friends. This is a very attractive book with clear text and sympathetic illustrations on each page, Nick Sharratt has a distinctive style which many will remember from The Suitcase Kid by Jacqueline Wilson. 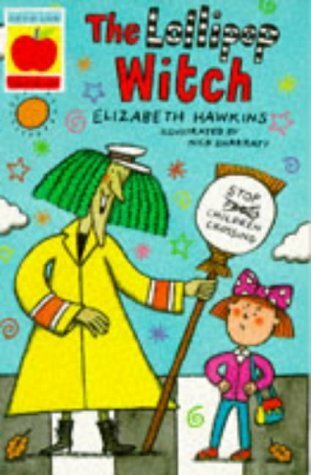 I am not sure what the present attitude is to witches and Hallowe'en, but I think lots of children of about six to seven will enjoy this book and realise the symbolic rather than realistic role of the witch.